Therefore it as advised that housewives should be careful early in the morning their front door steps to drive away any invasion or else not open one’s windows. People of Arundel on that date would shake themselves on Arundel bridge in the belief this would keep them free from fleas. Interestingly, Violets will bring fleas into the house in March according to an article in 1993 in Folklore called Plants used for pest control; some 20th century examples by Roy Vickery suggesting that being collected in 1985 there might have been some recent belief in the custom at least at Langtoft in Lincolnshire where it as collected. In truth it was probably the change in climate that allowed cocoons laid in dust and fabrics to hatch and fleas to appear in great number. A similar event happens in houses which have been unoccupied for a period of time, in this case vibrations awake fleas from their torpor. Of course, no one remembers the 1st for its association with fleas – the human flea the scourge described in this folklore accounts in virtually if not entirely extinct in the British Isles a victim of the vacuum and temperatures of our homes are warm enough to allow cat and dog fleas to be active all year…I’d still watch up for some fleas coming down your street on the 1st of March. Across the British isles it was believed and possibly still believed that eating blackberries after the 29th September was deemed a bad idea. Tradition tells us that on Michaelmas, the archangel Michael kicked Satan out of Heaven and he landed on a blackberry bush so annoyed he hit back and decided to prevent them being of use! Although the Scottish account of him wanting them for himself goes against that belief! 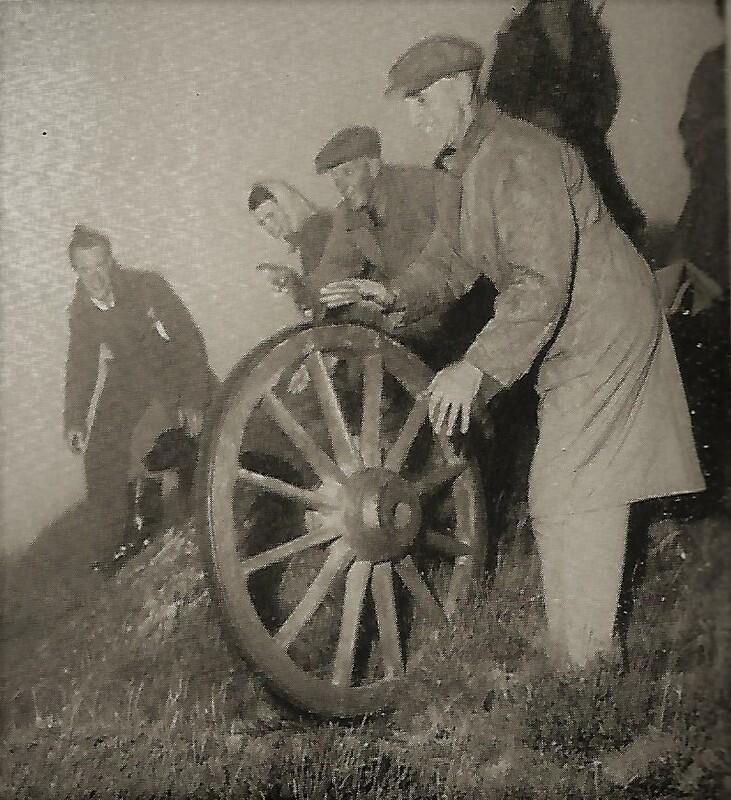 In the fourth-century Acts of the Martyr St. Vincent there is a description how in Aquitane, south-western France pagans rolled a flaming wheel towards a river and the charred remains were reassembled in their Sky God temple. Thanksgiving is a quintessential stateside custom, that it may surprise you to read that it is celebrated in the UK. It is not that surprising considering there are near 200,000 ex-pat statesiders in the country not to add those tourists who may be here for a holiday. The folklore tells that in 1620 the harvest failed at the Plymouth Foundation and half of the Pilgrim fathers died. Understandably when in 1621 there was a better harvest and so understandably they wanted to celebrate a particularly good harvest with their local first nation groups the Wampanoag. Indeed, it had not been for them they would not have survived, for they taught them how to grow corn, beans and squash – future staples of Thanksgiving. You’ll notice no turkey reports suggest the three-day feast included lobster, cod, deer and goose! Fast forward to the first President George Washington, who in 1789 proclaimed the inaugural national Thanksgiving Day. Yet despite it becoming an annual holiday in 1863 when it was set as the last Thursday in November, it too Franklin D. Roosevelt in 1939 to finalise the holiday setting it as the fourth Thursday in the month. And there is a comical photograph in Norfolk which account how after being given permission by the farmer servicemen attempted to capture a turkey for their dinner – it was not clear whether they granted any of them a pardon! Similarly, the American students studying in the UK and their societies would have promoted the event and indeed it is one of the first places to look for it today. However, ever eyeful on the commercial opportunity the main place you can find Thanksgiving in the many restaurants, often USA themed, dotted across the country and particularly in London which court American tourists. There can be found imaginative takes on the turkey, corn, pumpkin pie and other staples. Some are more than happy to spread it out to three days meaning they get lucrative weekend trade. Unsurprisingly one place where something more substantial is done is Plymouth. 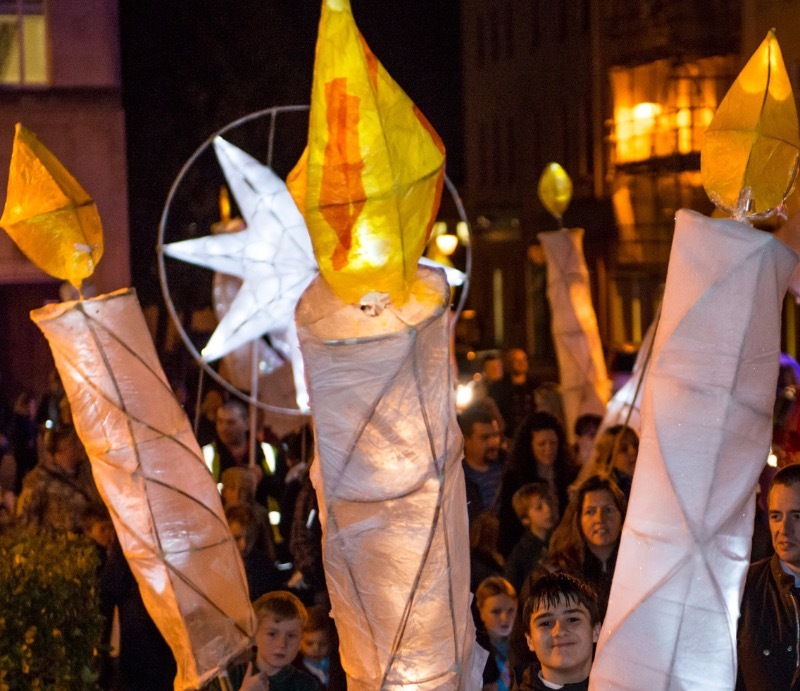 With its connection with the first pioneers, those Pilgrim fathers, Plymouth has commemorated their Mayflower and Transatlantic heritage for a number of years and in recent years it has been celebrated with some enthusiasm. The custom consists of the reading of speeches by the Lord Mayor and other figures on the Mayflower steps where those Pilgrim fathers sailed from followed by a poetry, choir. An illuminated carrying lanterns group representing the Wampanoag process from there to the Guildhall to tell the tale of Moshup the giant, a supernatural figure of the tribe. It’s the closest the UK has got yet to New York’s Macey’s parade. The other significant event is understandably a thanksgiving to God and this is where the US Ambassador speaks at a special service at St. Paul’s Cathedral, where America the Beautiful is also sung. The audience being again made up of ex-pats. However, the main stay of the celebration is the feast and now from Aberdeen to Wales, restaurants and University clubs will be serving up their feasts and providing kinship a necessary thing for those so far away. Will it ever establish itself here in the mainstream? It seems unlikely, we already have our Harvest festivals, although the semi-secular nature and not to say the facts it’s a holiday may be an attraction. Thanksgiving is far too personal and unique to the UK and like Guy Fawkes Night, which has largely died out as the British diaspora lost their Britishness, it would be rather soulless. Sadly, perhaps many reading this would rather have this opportunity for a brief respite before the Christmas rush, a moment for family, friends, good food and company. Instead, the commercial side of the custom, Black Friday, has since 2012 been slowly establishing itself here, albeit devoid of its actual reason and purely a money-making venture. I personally think I’d rather have Thanksgiving given a choice than this buying bun fight! So to those who sit down to their turkey, pork and cornbread or sup on three sisters soup, finishing off with their Pecan pie this year – have a good one, you may be more thankful you are overseas than ever for this Thanksgiving!? Lympstone? Devon? Surely that is an error? The Furry or Floral Dance is a Cornish custom and one established at Helston deep in Cornwall. Well it appears the picturesque Cornish town has long had a rival – in both the custom and appearance too I might add. In a bit of a furry! I had discovered the custom by accident. Researching a holiday down in Devon I came across a reference and at first dismissed it as a mistake. After a rather tortured journey down to Devon – should have been four hours – but with delays, hold ups, detours etc, it took virtually all day and I just arrived 20 minutes before the dance! The sun was shining and the small town was in party atmosphere. Parking at the pub on the main road, I walked the surprisingly long walk into the town, within minutes the dance had begun. Lympstone’s Furry Dance history is a bit confused. Locals will tell you it is something to do with fur hunters returning from Nova Scotia. The dance being established as some sort of celebration of their return. If so why does it have the same name as Helstons? Helston’s is associated with fertility. The coming of summer. Old pagan rites perhaps. But Lympstone’s is in high summer, although perhaps close enough to be associated with the old traditions of Lammas? The custom is certainly over 100 years old although details are difficult to find. It appears that it was revived and associated of the Furry Dance tune in 1933 by a local band master Bill Chapman and indeed the day was established as a way to raise money for the band. The custom was suspended for the second world war, but was revived in 1946. 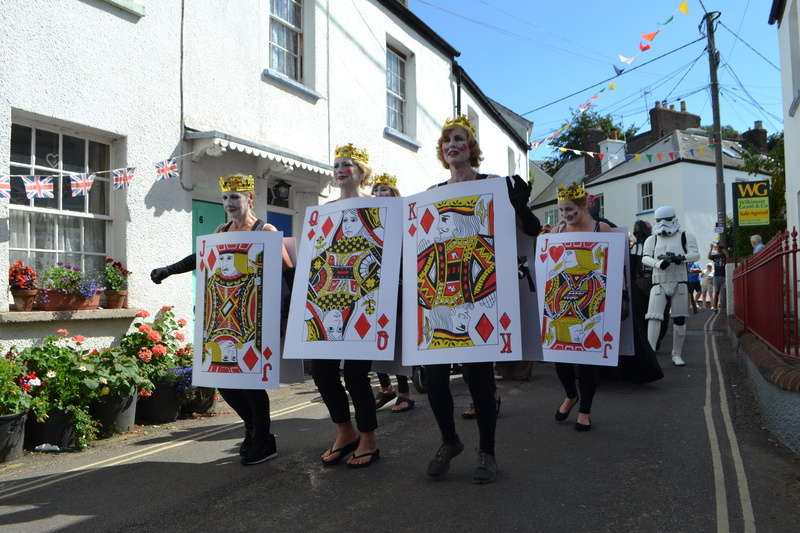 Stepping out at the front of the dance has always been a local honour and it appears traditionally the same man until they retired, Tom Kerslake did so until the 1950s, then apparently his son and then Graham Willis from until today. 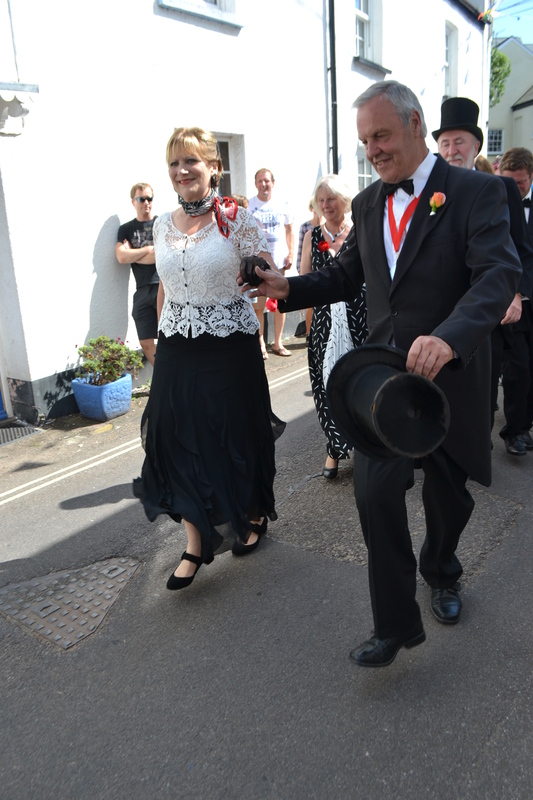 Dressed in top hat and tails they weave up the long street passing pubs and cheering visitors and locals, who make it a day of garden parties, kicking their heels to each side. Directly behind them the band belting out with vigour the traditional Floral dance tune. Then behind them a whole range of weird and wonderful costumes ranging Alice in Wonderland to Star Wars. The route is considerably lengthy and ends up with a well-earned rest at the Saddlers Arms where the curious assemble can be seen quaffing a drink and odd view for a passerby on the main road. 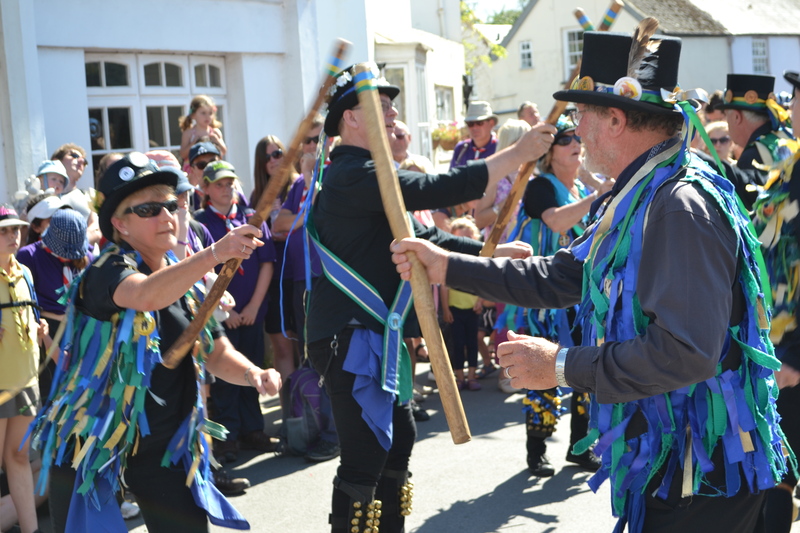 It is evident the Furry dance is more than a dance – albeit actually two, but a whole day of local of celebration with field events and some splendid fancy dress – the town lighthouses being of particular simple ingenuity – in Candy Field and ends the day in a blaze of fireworks. After the dance there was the familiar site of some rather colourful Morris. Perhaps this combined with the rarity of seeing it, possible ocular damage and a growing rationality lead to its demise. When the custom was no longer observed is unclear….Perhaps some people still make their quiet pilgrimage to their nearest hill or pool to see the sun’s joyous celebration of the resurrection.